Sitting in a car parked by the roadside, I am observing a distant electricity pylon. It is barely visible, but on it there seems to be an endangered Saker Falcon. But what are we doing in that meadow? We were searching for the territories of Saker Falcons. Serbia holds 13 per cent of the European breeding population of this “electrified” species which is not only Endangered in Europe but also listed as Globally Endangered on the IUCN Red List of Threatened Species. Okay, but falcons do not nest in the grass? M. and I were driving from one village to the next (from one puddle to the next) along the high voltage power lines, looking for the bird nests on them. Sakers do not build nest structures, but overtake them, mostly from Common Ravens. I’d love to see that fight: Ravens are somewhat bigger than Sakers, but falcons do manage to conquer, albeit those fights last for a week and falcons end up too exhausted to actually start breeding for another month or so! We map every Raven nest, noticing if it is occupied or not, and if it is, are the birds still rebuilding it or already incubating. Since the spring has come early, the latter was the norm of the day. Three months later, we are scorched by a merciless June sun, grass is already up to our waists and taller, while Common Skylarks are marking their territories with song flights. M. and I are slowly following overgrown tire tracks between fields of golden-coloured wheat. The grass is swaying under a passing vehicle, spreading pollen and killing me with allergy. I have eyefuls of tears, and am sneezing and wiping my nose – all at the same time. Raising the binoculars to teary eyes, I am trying to see the bird in the nest on a nearby pylon. There is not a movement in the nest. Many nests are empty: Raven chicks have fledged. Some are small and barely noticeable. Others are too far away and all I can see is air shimmering. Empting my water bottle in a hopeless attempt to quench my thirst… finally, a movement! The chick rises and its mother follows, all because its father has finally lost its nerves and, despite our presence, brought a freshly caught Striped Field Mouse (well, most likely). 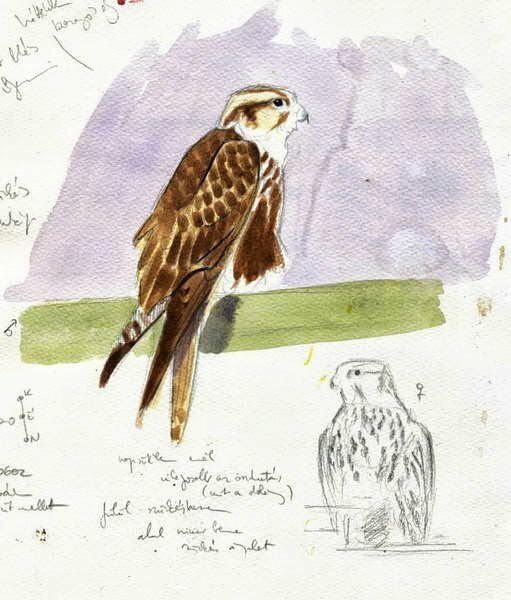 Still, we are a bit disappointed: those are not Sakers, but Common Kestrels – the only truly common falcon species of Serbia. 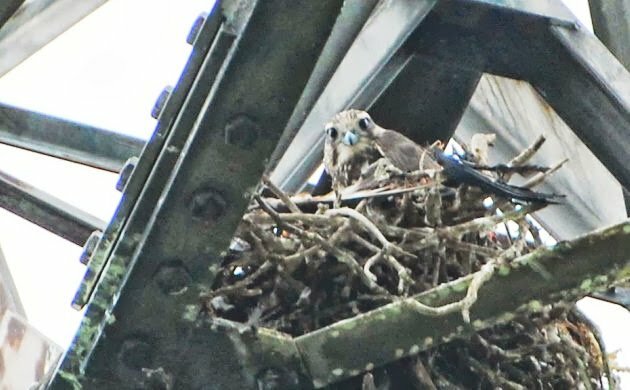 A bit further away, another occupied nest: a falcon! Still not Saker, but a Eurasian Hobby, the only one maneuverable enough to chase swallows while they are chasing insects in mid-air. Once I observed a Hobby playing with a Barn Swallow like a cat with a mouse: letting the already caught (and most likely – already dead) bird fall from its grasp, only to catch it again and repeat this several times. But the swallows aren’t helpless either: once I observed a Barn Swallow chasing a Eurasian Hobby that dared to fly too close to its nest. My eyes feel like full of dust and I cannot stop rubbing them while mapping this nest. Young Common Ravens have mostly fledged, and some nests are occupied by Common Kestrels and Eurasian Hobbies. We have even found a pair of Common Buzzards breeding on an electricity pylon – the second one in both Serbia and wider region ever. But, there is not a trace of a Saker nest. The only Saker we have seen was on a nest-less pylon. Passing that same electricity pylon again… The bird is too far to be absolutely certain (with binoculars only), but observing it there before gives a clue on a most likely ID. Still, the nest is nowhere to be seen. Aw, this was a very nice post. In concept I want to put in writing like this moreover ?taking time and precise effort to make a very good article?however what can I say?I procrastinate alot and certainly not appear to get something done. Unfortunately, the latest figures are showing a serious decline, around 35 per cent over the 10 years period. Prime suspects are pigeon fanciers. Of course, the birds are strictly protected, but the law enforcement is lacking. The question is, is only the enforcement in the field lacking, or is it the will to prosecute criminals, too? Why Aren’t There More Female Birding Superstars? Where Are You Birding This Third Weekend of June 2013?